Dedicated, exemplary and extraordinary are just a few of the words that describe Susana Payan, a volunteer at Granger Middle School who is being recognized as the District 204 BMO Harris Bank Volunteer of the Month. Payan was nominated for her work as a member of the Granger PTSA, where she currently serves as first vice-president, and chairs several PTSA events, including the Reflections Art program. She has dedicated herself to the Latino community at Granger and has made it her mission to ensure that all Latino parents feel like an integral part of the school. She initiated the Latino Grizzlies group at Granger; coordinated a trip to a Lewis University college fair for eighth-grade Latino students; and helped organize the first weekend culture trip for students, parents and teachers to the National Mexican Art Museum. She serves as a translator for parents during parent-teacher conferences and, for several hours each week, she is available to translate for any parent that needs help in any area. Payan is originally from Mexico City, where she was a doctor of internal medicine. In 2002, her family moved to San Antonio, Texas where she began volunteering at her children’s schools and became a member of the PTA. Because of her involvement, she received the President’s Award for Volunteer Service in 2008, the Texas PTA Life Membership Award in 2009, and the National PTA Life Achievement Award in 2010. In 2010, her family moved to Aurora and Payan once again volunteered at her children's schools. 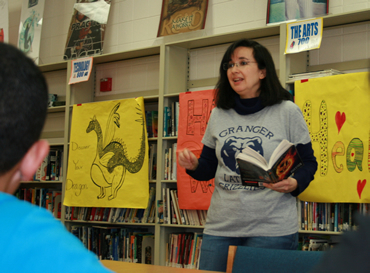 Susana Payan works with students in Granger Middle School’s library as part of her volunteerism at the school.